The new series of C osting the Earth is just beginning and Alisdair Cross, Martin Poyntz-Roberts and myself have been busy on location in the last few months. 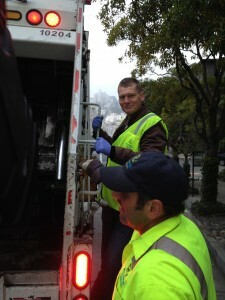 The most glamourous destination was San Francisco, though the topic was down to earth : rubbish. The city has a close to 80% recycling rate achieved through enlightened policy however some trash has now become so valuable that it’s stolen to pay for addictions. Those who follow Martin on twitter – @how_dairy – might think we spent our time mainly eating brunch but we also found space to grab elements for another programme: Rebel without a Car. We ask if we are seeing the end of the affair with the automobile in the West and where better to consider this than the streets where Steve McQueen’s Mustang flew in Bullit? Sticking to the movie theme, I’ve been a deerhunter in Scotland. There are now twice as many deer in the UK as horses and as numbers rise so do conflicts with us: fatal collisions, damaging gardens, chewing through forestry. But strangely, those with the stag in their sights are their greatest friend. We’ve also examined how to fireproof the British countryside a year on from last spring’s conflagrations. 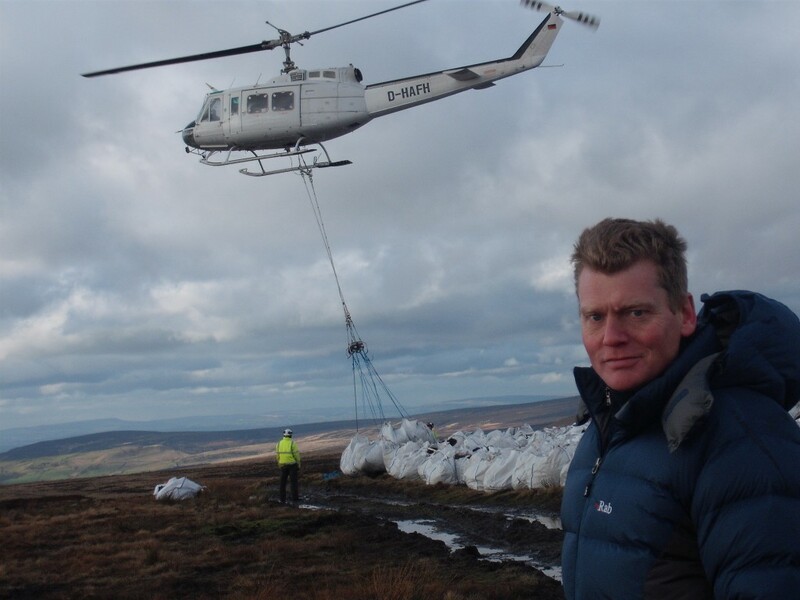 And air dropping sphagnum moss from a chopper – a critical action to enhance natural carbon capture in peat bogs or a pointless pricey sticking plaster? Alisdair and I get airborne above the Peak District to find out. From the butter mountains of a decade ago, millions are now facing starvation around the world as food prices rocket. This series will explores the facts and the myths surrounding the debate and the implications for food production in the future. Tom Heap gained exclusive access in the battle to save The Royal Show. Britain’s most prestigious agricultural event has been the showcase for the farming industry for 160 years, but the Royal show hasn’t made a profit in more than two decades. It’s been the victim of foot and mouth, atrocious weather and bluetongue. Tom followed the team at its home in Stoneleigh Park in Warwickshire as they tried to ensure that the 2009 show will once more establish the Royal as a premier event. But in April the plug was pulled and the Royal Agricultural Society announced 2009 would be the last event. Tom is a guest presenter of this long running farming series, recently discovering what happens on a turkey farm after Christmas and riding in a tractor cab as a satellite does the steering. BBC Radio 4 Special: Who killed the Cockney Sparrer? Nature detective Tom Heap investigates who, or what, is killing the common sparrow. Once one of our most common garden birds, it is now a rarity. Since the mid-1990s, London alone has lost more than two thirds of its sparrows and there are similar cases in Bristol, Edinburgh and Dublin. In an attempt to unravel the mystery, Tom delivers a dead sparrow to the laboratories of the Zoological Society and observes the autopsy which demonstrates that the cause of death is not always what it seems. He speaks to experts from various conservation bodies including the RSPB and the British Trust for Ornithology to weigh the latest scientific evidence. Tom finds out about the chief suspects, including cats, sparrowhawks, unleaded petrol, mobile phones, garden make-over programmes and loft conversions.